Neuromodulation 2016; E-pub ahead of print. DOI: 10.1111/ner.12536. 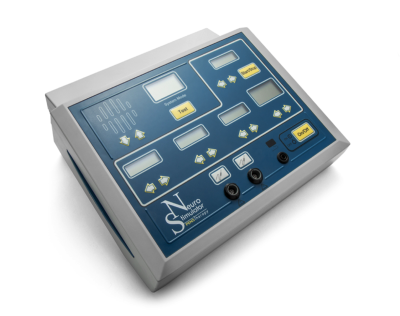 Background: With its relative simplicity and safety, peripheral nerve field stimulation (PNFS; PENS) is contributing to the re-emergence of peripheral nerve stimulation as an effective therapy for neuropathic pain (NPP). responded to injections of botulinum toxin to the stellate ganglion. Each of approximately ten injections had given complete or nearly complete relief for six weeks to six months but two subsequent injections were ineffective. After giving her fully informed written consent on each occasion, the patient underwent 26 sessions of PNFS over five years and two months. Both authors performed the procedure on different occasions, identically and with no difference in outcome. 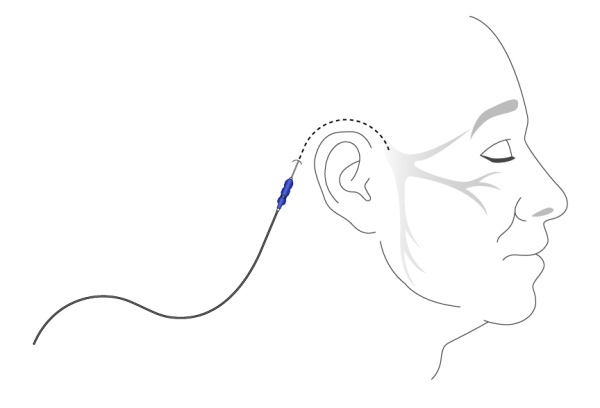 After injecting a 2–3 mm bleb of lidocaine 1% and puncturing the skin with an IV cannula, a 21 gauge 50 mm electrode was inserted upwards subdermally over the left mastoid process to 20–25 mm. The entry point was approximately 5–10 mm below the tip of the mastoid process. The electrode passed along the long axis of the mastoid process and approximately over its midline. 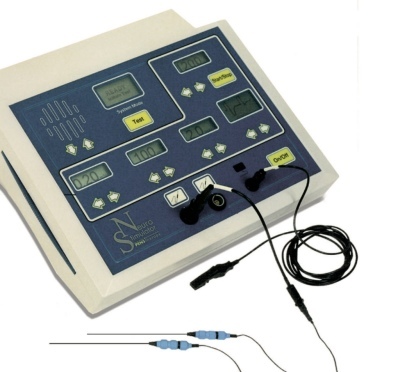 Stimulation alternated between 2 and 100 Hz at three-second intervals and was delivered, above sensory threshold, at 1.4–2.4 volts (typically 1.7–2.2 volts) for 25 min (Algostim TM; Algotec Research and Development Ltd., Crawley, UK). The stimulation paradigm was based on published evidence for an increased release of encephalin, b-endorphin, and endomorphin with peripheral stimulation at 2 Hz and of dynorphin at 100 Hz, with a combination of the two frequencies accelerating the release of all four (5). PNFS is a relatively simple procedure and the present case demonstrates that it is safe and well tolerated in an elderly patient. It was consistently very effective for the severe pain and allodynia and for the motor impairment, for several weeks after each treatment session. The response increased over the first few treatments and no tolerance developed during 26 treatments over five years. The response was relatively short-lived on one occasion and it seems reasonable to attribute this to a simultaneous personal tragedy, reflecting a limbic influence on the pain or on the mechanismof its relief. Itmay, however, have been coincidental. Scarring was not an issue despite the multiple reinsertions of an electrode; there was no increase in difficulty of inserting the electrode nor of the threshold voltage over time. Stimulation was in the territory of the great auricular nerve and/or the lesser occipital nerve (both C2,3). The evoked sensation was felt simultaneously in this spinal distribution and throughout the trigeminal distribution. The relief of the allodynia spread seamlessly through the same territories. Although it is possible that the stimulation over the mastoid process also affected the trigeminal nerve directly, it raises the intriguing suggestion that the effects of PNFS may not be restricted to the nerve field occupied by the electrode. In the present case, there appeared to be generalization from spinal to cranial nerve fields. It is anticipated that this would involve the brainstem trigeminocervical complex. The radial (rather than dermatomal) spread of the abolition of the allodynia from the point of stimulation, which occurred over several minutes, also suggests central activity. Even if some trigeminal fibers were stimulated directly, the effect generalized beyond one division of that cranial nerve. Although the stimulation paradigm employed was based on knowledge of the increased release of four intrinsic opioid peptides, there is no evidence that this was relevant to its mechanism of action in the present case. Although the limitations of an uncontrolled single case report apply, the persistence of the response with a large number of treatments over several years, the objective evidence of abolition of allodynia, the radial spread of the relief and her description of the return of the symptoms, all argue against a placebo mechanism. The effect of subthreshold stimulation might have informed this further but was not tried in this therapeutic situation. Furthermore, evoked paresthesiae appear to be an important predictor of success with PNFS (4). Our elderly patient was adamant throughout that she found the prospect of an implanted system aversive and unacceptable to her. She was content to travel to the hospital and to endure some discomfort to obtain the prolonged periods of relief. Her case illustrates the feasibility of intermittent treatments, even over several years, if an implant is unacceptable (this may be particularly likely in the elderly), unsuitable or unavailable. 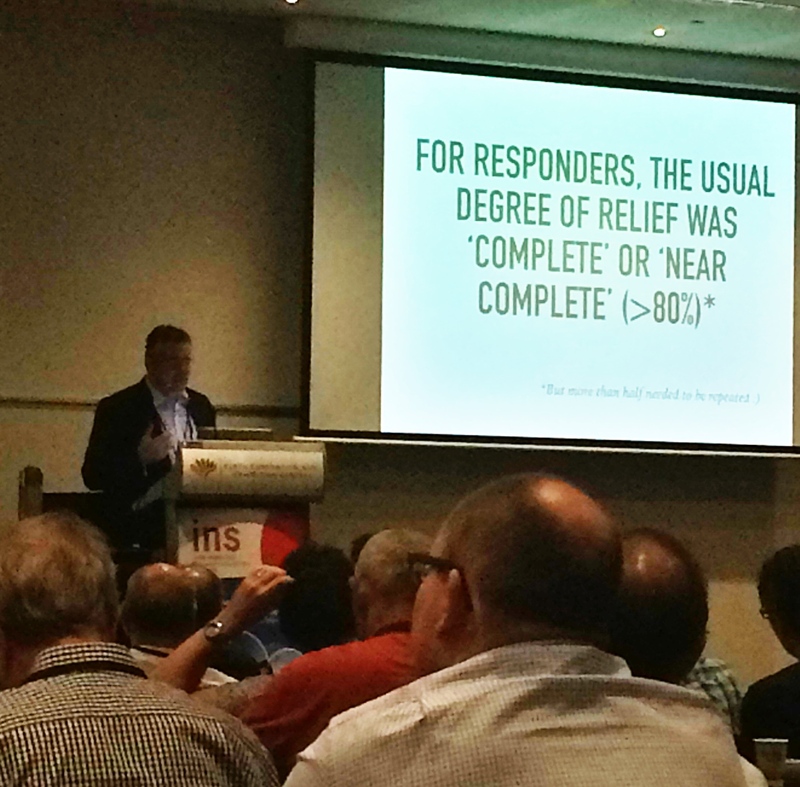 It was possible to adjust the timing of treatments to optimize relief at special times such as Christmas, vacations, and a family wedding. Heterogeneous economic status and pressures create wide geographical variations in the availability of implantable neuromodulation devices; the technique described here may provide a substantially cheaper alternative in many cases. Conclusion: Serially repeated PNFS can provide sustained relief of NPP over long periods, without tolerance, where a permanent implant may be inappropriate, unavailable, or declined.